Mega Man X2 100% TAS in 32:57.7 by Hetfield90, FractalFusion, hidaigai, nrg_zam, & GoddessMaria. Emulator used was BizHawk 1.11.7. Finally after starting this TAS over a year ago and restarting it several times, it's finished. The idea to make a "100%" TAS of this game came about after it was found to be faster to forego acquiring the Shoryuken in "any%", since "100%" became a more appropriate antithesis to "any%" at that point than "low%, best ending". As per the judgment message from the "all upgrades" submission, this TAS is intended to obsolete both the "low%, best ending" as well as the all upgrades runs. As a side note, the rerecord count for this run is completely inaccurate, since it was made from separate projects which were hex edited together. Determining the optimal route for "100%" was the most complicated and time consuming aspect of creating this TAS, as a lot of variables needed to be taken into account: Maverick weaknesses, miniboss weaknesses, X-hunter weaknesses, on which stages the X-hunters are fought, when they are fought, and how soon mobility upgrades such as charged Speed Burner, Strike Chain, Neon Jumps, and Crystal Hunter are acquired. I figured the most efficient way to test all of these things would be to first test how fast each stage and boss could be completed with full upgrades, then find out how much time is lost by not having each upgrade where it can be used to save time. Then after brain storming as many remotely viable routes I could think of, I simply plugged in the amount of time lost for each shortcoming of each route and added them up, in which case the route with the lowest number would be the fastest. Here is a table detailing the routes tested and the time losses of each routes' weaknesses. Mobility-Related Weaknesses: Since this part is the most time consuming to test, I saved it for last, and thankfully most of it ended up not being necessary. Since I was only trying to find out which route is fastest and not necessarily by how much compared to other routes, the only route that needs a complete table with all values filled in is the fastest route (#16). If the time loss of another route surpassed #16 without that route's mobility weaknesses being tested, then it merely means the other route is even slower by comparison than what my data suggests. Boss/Miniboss Weakness-Related Weaknesses: This was the most straight forward part of of the tests. Having the X-hunters' weaknesses when fighting them is somewhat of a double-edged sword: you kill them faster with their weakness, but you generally need to fight them later in the run to have their weakness(which results in time loss from more warping on and off the map between stages). The first is the location of the X-hunter room in each stage(shown in the pink table). Some X-hunter rooms allow you to take a shortcut through the stage and even eliminate door transitions where you lose control of X whereas others force you to take a detour. Crab is the best stage to fight one for several reasons: it takes a shortcut through the stage, the shortcut is underwater where X climbs twice as fast, the door transition leading to the X-hunter room is much faster than every other door transition, and you eliminate the water draining sequence that is in the normal route through the stage. Gator is the second best because it also takes a shortcut through the stage, but unfortunately fighting an X-hunter on Gator requires doing Gator 4th at the earliest because of the X-hunters' warp patterns, and losing the buster upgrade on 2 stages isn't worth it. Also, neon jumps save a little bit of time in getting to the X-hunter rooms in Crab and Stag. I didn't bother testing the Sponge room since it not only takes the longest by far to get to(you have to wait for the elevators going to and from it), and doing Sponge later either forces you to either significantly delay picking up the arm parts or fight Gator without strike chain. The second is when you fight the X-hunters(shown in the blue tables). The sooner you fight them, the earlier you get them off the map between stages, but if you beat all 3 of them before defeating all 8 Mavericks you get an extra 500 frame cutscene where Dr. Cain tells you he needs more time to reassemble Zero. Because of these two things, the ideal timing for fighting X-hunters would be on stages 3, 4, and 8. Even with the time savings of reverse wall jumps, it was still not possible to make an earlier global timer cycle at the arm parts capsule in Gator's stage. As such, optimizing everything up to the arm parts continues to entail simply reducing any and all lag frames until we can somehow save enough gameplay frames to make an earlier 64 frame cycle. Reverse wall jumps in handy in a number of places in Gator's stage, particularly in dodging the bird after the jump>charged chain off the spikes before the second elevator. The RWJ over the pillar before the last outside section of the stage was only 1 or 2 pixels slower than the strike chain jump, but this resulted in a net 0 frame difference due to the subsequent strike chain on the sloped ground up ahead being made longer. Originally I had thought you would need to force the beetle to break the wall in order to get to the X-hunter room without neon jumps, but FractalFusion discovered that you can surf on him instead. Even without neon jumps, Stag's stage is still the 3rd fastest stage to fight an X-hunter on since it has double doors so you don't have to backtrack to get out of the room. It also reduces quite a substantial amount of lag to not have to deal with the lag caused by the sinking pillars in the route below. Serges has a glitch where if you press fire at least once every 10 frames, even if your volley is maxed out and you don't shoot, his shield won't activate. Strike chain will also deactivate his shield while its out, allowing us to do one strike chain<charged buster doppler effect to offset the odd amount of damage that was done by the first charged shot combo of the fight. This is the 3rd worst stage to fight an X-hunter on since, even though it's not too far out of the way, you have to go through two boss doors to get to it(unlike any other X-hunter room). The RWJs near the ceiling while waiting for the block to pass through the narrow opening before e-tank simply allows you to pass through the gap at a higher velocity. Radar Killer is much easier to manipulate now since RWJs allow you to fire speed burner to the left as you're climbing the wall before the fight(firing it to the right causes lag). Before you would have to manipulate in Chop Register's room and then be subject to the falling blocks in the next room completely changing the RNG anyway and causing greatly varying amounts of lag, so you would just have to try some amount of dust sprites and hope the stars align and give you few lag frames and a non-jumping pattern to start. The 4 small fish at the start of the stage have to be manipulated to do specific swimming patterns to you can kill them at certain times with buster to reduce lag. Sea Canthler(the giant fish miniboss) has a number of different hitboxes with varying amounts of hp, and you only have to kill a certain number of them to finish him off. How high or low he swims is based off RNG, so you need to manipulate him to swim low so he'll open the bridge earlier. How quickly his swims is based on X's X position. Being to the left of Sea Canthler will cause him to swim slower, and being to the right of him will cause him to swim faster. This is extremely important in getting the off-screen kill on him with spinning wheel, since you have force him to open the bridge at a specific time so your he won't start to swim down before the spinning wheel finishes off his final hitbox. We got completely bodied by bad luck on Violen's first pattern. There really isn't anything you can do to advance RNG in this stage since speed burner does not have any randomly-particles while underwater, so we simply had to delay frames(I think it was around 8 or 10) to get the proper starting pattern from Violen. As far as I could tell, Violen has 5 different possible actions: horizontal ball & chain, vertical ball & chain, jump, shoot, and jump & shoot. I tried doing the fight with the other starting patterns, but I couldn't get any of them to yield a permutation subsequent actions that allowed for the same number of full-screen doppler effects where Violen falls on top of a shot. We also got bodied by RNG on the Crab fight. You want him to walk towards you then throw up his pincers for his first two actions. Since the Violen fight has to end with Violen and X on the ground, you only have a very limited amount of time to manipulate for Crab near the end of the fight. Because of Crystal Snail's pre-fight spiral 8-frame frame rule, there where a couple instances during the stage where I could either make the choice of sacrificing a gameplay frame to reduce a lag frame, or save the gameplay frame and take the lag frame. This let me control which gameplay frame I arrived at the Snail fight without changing the actual number of real time frames it took to get there, allowing for the fastest spiral pattern at the cost of no frames. I was really hoping for the optimal route to be one with Snail 3rd since it uses the ride armor for the majority of the stage and can even skip Magna Quartz's screen lock trigger with the lunge. Since the timer for Ostrich to thaw beings after he his the ground, you want to bait him to jump up to the very top of the hill. Unlike in "any%", you can still hit him with buster when he jumps from the highest altitude by slope jumping and air dashing. The RWJ before the heart gets to the heart slower than the strike chain jump, but saves all that time and more by allowing you to speed burner to the left after picking it up, and retain that speed burner speed going right into the building. Morph Moth's stage is the only stage in this TAS where an X-hunter was fought that wasn't on one of the 3 ideal stages to do so. Ideally we would have liked to fight him on Gator instead, but moving the buster upgrade that much later in the run simply wasn't worth doing in any route. Since charged strike chain always guarantees a drop when it kills something, independently of the enemies normal drop table(yes, this even includes bosses), the charged strike chain before the second junk bot miniboss had to be replaces by a speed burner>strike chain because we were missing health from the Agile fight. The RWJ at the end of the 3rd crusher climb allowed us to use two neon jumps during the climb instead of having to save the second one to charge for speed burner. Nothing new here that isn't already in the "any%" or "all upgrades" runs. There were a couple uses for RWJs in this stage. The one just before the boss door is neat since it achieves the same goal as the crystal hunter wall jump while also allowing you to use a strike chain. This boss rush is a nightmare of frame rules and RNG manipulation. Not only do you have to deal with Crystal Snails spiral frame rule once again, but shoryuken itself also has a frame rule where it only deals damage on even values of the global timer. Bubbles are your best friend for RNG manipulation during the warp room, but can only be used before specific capsules. You also have some time to do some manipulation in between Morph Moth phases. The 100%-only Shoryuken/Zero cutscene/final fights glitches finally get to be shown off in a TAS. I initially though it would be faster to clear the the text box after Zero punches X through the floor immediately so you don't have to waste time walking over to the left before Wolverine warps in(you can't move X left or right while that text box is still up), but apparently clearing it at a specific time forces the Wolverine fight to start before his pre-fight dialogue box even appears in the first place, as opposed to being cleared immediately. Delaying the clearing of that text box also allows you to retain movement before the Wolverine fight, which was already known. Additionally, if you are in Shoryuken animation when Wolverine's hit points finish filling up, the animation will be interrupted but you will retain the animation's invincibility status during the fight. 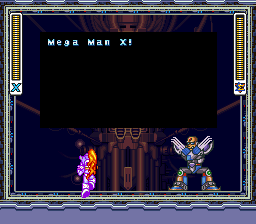 Unlike X1, text boxes don't add lag during explosions, so I just left it up during the Sigma Virus fight. For some reason, this also caused Sigma Virus to be invisible after the fight where he's normally seen flailing around the room. Samsara: Accepting as an improvement to this published run and also this one.